1923: Founded as the ‘Waddon Swimming News’ by Captain Bertram Cummins, the magazine was published in A5 format (which continued until February 1984.) Four pages and five issues per year. The first year’s cost (£10) is defrayed by a local drapery store. It was written in a back room of his house (4, Waddon Park Ave) in a suburb of Croydon and initially concerned mainly with local swimming club issues and news. 1924: Lucy Morton, of Blackpool SC, wins Britain’s first ever individual ladies swimming gold medal at the Paris Olympiad for the 200m breaststroke. 1925: Magazine changes its name to ‘Swimming Times’ in response to repeated requests for a national swimming periodical with news and results from FINA, the ASA’s five districts, the RLSS and individual clubs. Published still by Waddon Swimming Club – two shillings per year for seven issues subsidised largely by subs and adverts e.g. ‘Horlicks, the Ideal Training Diet for Swimming’ and ‘Bovril – for better staying power’. The circulation was 800. Its first editorial scoop is to announce the arrival of a star, Miss Joyce Cooper (Mermaid SC), who subsequently won Olympic silver and four of the five gold medals available to women at the first Empire Games in 1930. 1927: The magazine includes a postcard giving ASA approval – ‘Every swimmer should read the Swimming Times’. Now recognised and supported by RLSS, ADA and the Bath Superintendents. 1929: Circulation jumps to 3,000 as it is ‘sent to all four corners of the globe’. The front cover (illustrated left) is the same for each issue in the year – bar a change of colour. 1933: Magazine breaks all records in becoming the longest running swimming periodical surpassing ‘Swimming’ from the 1890s, ‘Swimming Magazine’ (first decade of the century) and ‘The Swimming News’ in Scotland which lasted 10 years. Remains the longest-lived swimming magazine in the world. 1935: The first Centralised Championships of the ASA at Blackpool are reported by Swimming Times which increases in size to 60 pages and is published nine times per year. 1939-45: Swimming Times remains in continuous publication throughout World War Two with Janet Bassett-Lowke as acting editor, reporting on ‘Holidays at Home Galas’ and ‘Wartime Careers of the Notable Swimmers’. Problems encountered are paper shortages and little swimming news. It celebrated 21 years of publication in 1944. 1948: The Silver Jubilee volume has a photo of Roy Romain with his breaststroke using overarm butterfly technique and the magazine is now published every month. 1952: The Olympics are held in Helsinki with Eleanor Gordon winning bronze in the 200m breaststroke. The Swimming Times helps raise £6,000 towards the GB Olympic training fund with the memorable slogan: ‘a bob a nob will finish the job’. 1954: Bill Juba starts a long association with Swimming Times as sub-editor with ‘Teenagers Page’ and ‘World Scene’; the first swim galas are televised and Matt Mann, the leading American coach, held clinics at the Loughborough Training Course. Scotland wins three golds, one silver and three bronze medals at the Vancouver Commonwealth Games to be the leading home nation. 1956: A golden age in British swimming starts with Judy Grinham’s win in the 100m backstroke at the Melbourne Olympics (and new world record) – the first individual British win since 1924. Margaret Edwards, the 220yd world record holder, took the bronze. Swimming Times becomes a small limited company with Capt Cummins, the founder editor, as managing director. 1961: Tribute is paid to the work of Bert Cummins, now age 80, but still going strong as the veteran editor, as he becomes the first winner of the ASA’s Harold Fern Award. 1965: Age group swimming pioneer, and future Swimming Times editor, Dickie Brown writes an age group section for the magazine. After four years of effort, the ASA agrees to National Age Group Competitions in 1966, sponsored by Fox’s Glacier Mints. A total of 70,000 11-14-year-olds contested the early rounds with 400 reaching the finals at Blackpool. According to Swimming Times, ‘a flame has been lit’. 1970: Harold Fern steps down after 49 years as ASA Secretary to be replaced by Norman Sarsfield, the first paid secretary. The front of the magazine goes colour with a Speedo ad. ‘The Martin Report’ brings out proposals for the future of swimming in England and the one millionth personal survival badge is won and reported on in Swimming Times. 1971: After 47 years and aged nearly 90, editor Bert Cummins steps down (the death of his assistant Bill Juba was a big factor), and the ASA takes over the magazine with Kelvin Juba as the new editor. The first Short Course ASA Championships are held in Worthing with Brian Brinkley and a young Scottish breaststroker with goggles, David Wilkie, the stars. 1972: The February issue has the first ever British age group ranking list, whilst the November issue has David Wilkie on the front following his 200m breaststroke silver medal at the Munich Olympics. The caption asks whether he is a ‘symbol of Britain’s swimming future?’ The magazine is priced at 10p. At the end of the year, Swimming Times ‘presents its first ever Swimmers’ Annual, a concentrated volume of previously undocumented information’ including lots of results, the world top ten, reviews of championships and records for the year. 1973: The new editor, from the February issue, is Dickie Brown. The ASA establishes its headquarters in Harold Fern House in the centre of Loughborough. Otter SC organise Britain’s and Europe’s first Masters Meet. Green Shield sponsors the Age Groups and Coventry employ Hamilton Bland for a training scheme as the first professional coach to a local authority. At the first swimming World Championships, in Belgrade, David Wilkie wins the 200m breaststroke gold in a world record time of 2:19.28. 1986: The Commonwealth Games are held in Edinburgh. Caroline Cooper, Caroline Foot and Sam Purvis go 1-2-3 in the 100m Butterfly and are pictured on the front of Swimming Times. Adrian Moorhouse takes revenge for his silver to Victor Davis in the 100m Breaststroke by winning the 200m event. Andy Jameson won the 100m Butterfly and Sarah Hardcastle the 400m Freestyle. 1987: At the Arena Festival, in Bonn, Adrian Moorhouse makes history with the first sub one minute 100m Breaststroke with 59.75. 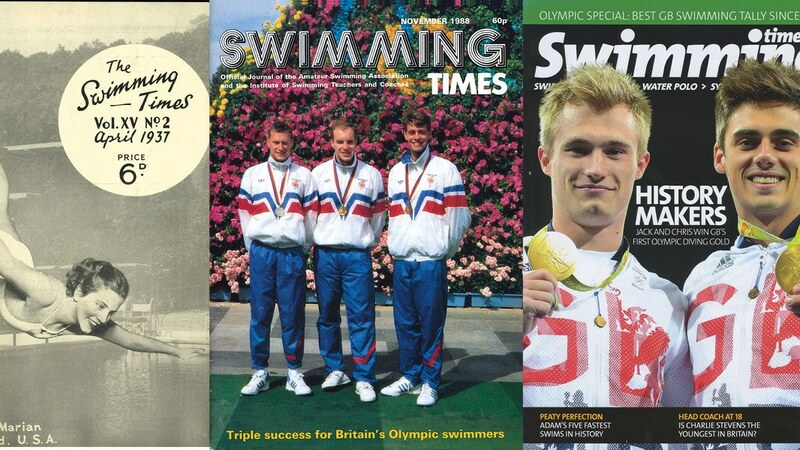 Dickie Brown says goodbye to Swimming Times after 15 years as editor, a couple of his innovations being ranking lists and results at a glance. The acting editor, until Feb 1988, is Alex Cave and then Douglas Pyecroft took over. 1988: The February edition sees a switch from the familiar A5 to A4 for the magazine. Adrian Moorhouse wins gold at the Seoul Olympics in the 100m Breaststroke by 0.01, whilst Andy Jameson takes bronze in the 100m Butterfly. Nick Gillingham completes Britain’s hat-trick with a brilliant silver in the 200m Breaststroke. July sees a new editor for Swimming Times with Karen Glendenning at the helm. 1993: Britain hosts the European Championships in Sheffield with Nick Gillingham winning his third successive 200m Breaststroke title and adding silver in the 100m. Paul Palmer took silver in the 400m Freestyle. 1994: Although heavily involved with the July issue, Peter Hassall takes over as editor with the August issue and a new look Swimming Times emerges with Nick Gillingham on the front cover draped in lane ropes. Nick produces the goods at the Commonwealth Games with gold in the 200m Breaststroke and silver in the 100m. The first ever colour photo inside Swimming Times is of Nicola Goodwin, of Nova Centurion SC, in the July 1994 issue. 1998: Top swimmer James Hickman chronicles his career in a diary for the magazine. He goes from strength to strength as an international performer. After multiple British records in butterfly, IM and backstroke, his first world mark comes with a short course 200m Butterfly record. Other contributors in recent years have included Ann Clark and Maria Ramos for synchro; Tony Warn and Verity Dobbie for masters; Gerald Forsberg and Alison Streeter for open water; Alan Donlan for education; Andy Morton for water polo; Wally Clark and Sally Freeman for diving; Julia Jarvis for teaching/coaching; Giles Long and Izabel Grindal for Para-swimming; and prior to that, Sarah Bailey, now Dame Sarah Storey after multiple Paralympic golds as a swimmer and latterly as a cyclist. 2001: September sees a major redesign for the magazine and temporary change of name to ‘Swimming’ which lasts until the October 2005 issue. A survey is undertaken regarding the name change and the overwhelming majority wished to revert back to Swimming Times. The winner of the prize draw in connection with the survey is Valerie Preston, who first subscribed through Surrey Ladies SC, as Valerie Nares-Pillow, back in 1949. 2007-09: The pagination continues to rise through 2007 and 2008 before settling on an average of 84 and then another redesign for the June 2009 issue, which is very well received. Terry Denison, chair of the BSCTA, comments: “Congratulations on the new look Swimming Times. The photos are excellent and the new layout of the articles looks more professional. All the articles were interesting and well written and I congratulate everyone in producing the magazine in this format.” The September 2009 issue goes to 96 pages with 22 pages reporting on the world championships in Rome and a good cover shot of Gemma Spofforth with her gold medal taken at the Trevi Fountain. 2012: In a major effort for the London Olympics/Paralympics, a digital product and a presence on WH Smith shelves and other trade outlets is established. The magazines detailing successes at both Games are the biggest and best ever at 164 and 116 pages respectively. 2014: The Commonwealth Games are held in Glasgow/Edinburgh and Jack Laugher features on the September cover after his two gold and one silver medals. Earlier in the year, celebrity chef, Tom Kerridge graces the cover and is keen to extoll the virtues of leisure swimming, as does Penny Mordaunt MP, the current International Development Secretary. 2016: The magazine reports on Rio Olympic gold for Adam Peaty and the first ever Olympic gold for British divers in the shape of Jack Laugher and Chris Mears – celebrated on the front cover, 92 years after Lucy Morton won Britain’s first ever ladies Olympic swimming gold (see 1924). 2017: The December issue is the last of Peter Hassall’s tenure as editor, after 23-and-a-half years at the helm. 2018: The magazine goes bi-monthly, retaining a digital version and continues to be an important voice in the aquatic world. Alison Clowes is editor for the January-February edition before Ian Whadcoat takes on the role later in the year. 2019: The January-February edition is the final edition of Swimming Times. Pick up the final collector’s edition now from our online shop.